Gene W. Kallsen, MD, (left) and Jim Comes, MD, (right) at Dr. Kallsen’s retirement party. 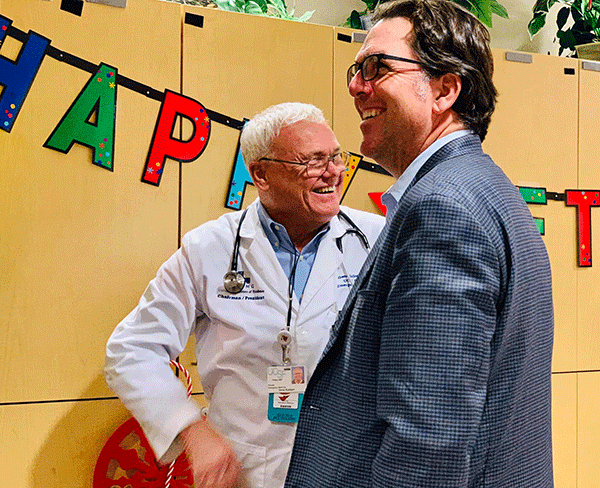 Three trauma teams had been activated at Community Regional Medical Center as UCSF Fresno’s Gene W. Kallsen, MD, completed his final shift of a 50-year medical career that paralleled the development of emergency medicine as a specialty. Dr. Kallsen took the bustling in stride. He has had plenty of experience with hectic workdays. He started medical school in 1968 – at the height of the Vietnam War – and the same year that emergency medicine began with the formation of the American College of Emergency Physicians. But development of emergency medicine as a recognized specialty would take time. Dr. Kallsen completed his UCSF Fresno residency in 1979, the same year the American Board of Emergency Medicine was approved, and Emergency Medicine became the 23rd and youngest-recognized medical specialty. Starting on the ground floor of Emergency Medicine, Dr. Kallsen became a trailblazer and leader. 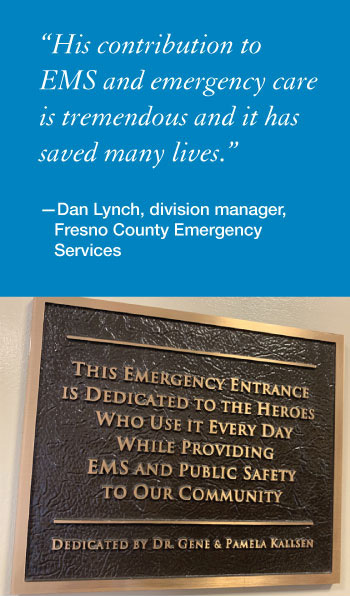 Fresno County, becoming the county’s first EMS medical director in 1981. Dr. Kallsen fought to fix ambulance services in Fresno County. The county had four competing ambulance companies dispatching drivers to pick up patients on a strict rotation system. It meant someone could wait 20 minutes for an ambulance to arrive from across town while a closer competitor was not allowed to take the call. The county now contracts with one ambulance company. “I thought it was a pretty crazy system and needed to be fixed,” Dr. Kallsen said. Dr. Kallsen served as chief of the UCSF Fresno Emergency Medicine Program for about 23 years, helping to establish the four-year ACGME-accredited residency into one of the most sought in the country. Michael W. Peterson, MD, associate dean at UCSF Fresno, first met Dr. Kallsen when interviewing for the position of Chief of Medicine for UCSF Fresno in 2001. Dr. Kallsen chaired the search committee, and he and Dr. Peterson shared a Midwestern background. Both graduated from the University of Minnesota Medical School (although not in the same years). Manavjeet S. Sidhu, MD, MBA, a UCSF Fresno Emergency Medicine resident, came from New York. “The patient volume, spectrum of pathology, as well as acuity are unmatched and allow for training that prepares residents for any future job in emergency medicine,” Dr. Sidhu said. U.S. Rep. Jim Costa acknowledged Dr. Kallsen’s contributions, presenting him with a Congressional Resolution at a party held at his last shift on Dec. 28. “We stand on the shoulders of leaders like Doc Kallsen,” Costa said. As past president/chairman of Central California Faculty Medical Group (CCFMG), Dr. Kallsen remains a member of the executive committee. CCFMG is the faculty medical group for UCSF Fresno. To honor his work and service to UCSF, a professor emeritus title is in process for Dr. Kallsen. And his legacy will continue with the endowed chair named in his honor. Endowed chairs, associated with the most prestigious educational institutions, are held by distinguished faculty. Dr. Kallsen and wife Pam Kallsen were generous supporters of the endowed chair. For the near future, Kallsen said he plans to travel and spend more time with family, which includes four young grandchildren and another on the way.